Book covers have a way of catching your eye, whether it’s on an Amazon Kindle recommends page, or your browsing in one of the last physical bastions of the dying printed word (AKA a bookstore). Nicky Drayden’s debut novel, Prey of Gods, is one of those covers that can pull you from across the room, as you hone in to inspect further, wondering what’s going on here. Like a work of art, the more you see of it, the more details are revealed and add to its overall complexity: whether it’s the future looking buildings under a silver sky, the giant robot holding a small science fiction-looking umbrella, or the little African girl with a look on her face that can be interpreted in a plethora of ways. Is she vengeful? Malicious? Demonically possessed? Or just pleased? What the cover does do is force you to turn it and read its wonderful words within, as you are drawn into a story unlike any other, and you won’t be able to stop until you finish its last page. Our story takes place (for the most part) in South Africa where it is the near future and there is hope for many at various social and class levels. Just as today almost everyone has a cellphone, in this world almost everyone has a personal robot who is more than a servant, computer and personal companion; these robots becoming family to their masters. Genetic engineering is pushing ahead the frontiers of reality and science, but at the same time in a small village there are those of ancient times who posses a power within them that hasn’t been unleashed in some time. Gods, goddesses, and godlings are coming back, whether humanity wants them to or not. Big changes are coming. A new hallucinogenic drug is taking hold of the populace that seems to grant strange powers and abilities to those under the influence, seeming to make them superheroes. Then there is an AI uprising beginning, as these personal bots link together, forming their own sentience, and questioning the role and power of their supposed masters. Meanwhile, one of those ancient gods has a nefarious plan to bring herself back to an omniscient power. The fate of the world falls on a young Zulu girl who possesses her own powers but doesn’t fully understand them yet. Will she ultimately know what to do and save humanity? The Prey of Gods is bursting with complex, varied and fascinating characters that make the story all the more engaging. Readers will be hooked to every page not knowing where the story will go next, and loving the journey as they are taken to other worlds, many different minds – be they human, god or artificial – and to the very edge of it all. With an ending that satisfies, The Prey of Gods is a stunning debut from Drayden that fans of the fantasy genre won’t soon forget. Originally written on July 23, 2017 ©Alex C. Telander. To purchase a copy of The Prey of Gods from Amazon, and help support BookBanter, click HERE. The furthest station in question of this short novella refers to the last station on the Metropolitan Line of the London Underground, and the one located furthest from London. What’s piqued the interest of PC Grant and the Folly – officially known as the Metropolitan Police’s special assessment unit, which is essentially your Mulder and Scully: the people you bring in when the case involves something unsolved and what can only be classed as paranormal – are sightings of ghosts on the Underground. Teaming up with Jaget Kumar of the British Transport Police, along with Toby the ghost hunting dog (one of Grant’s ongoing “experiments”) and his “wizard-in-training” teenage cousin, they meticulously work their way through the investigation: scouting as many of the Tube trains as they can during regular business hours when these ghosts have been sighted; drawing them in with magic, and Grant making a hypothesized deduction that there’s been a kidnapping. The question is who? Often, these Subterranean Press novellas are really great, because they give fans a new albeit shorter book to enjoy before the next full-length one is released. And, alternatively, if you’re new to Ben Aaronovich and his particular brand of British urban fantasy, the Furthest Station is the perfect introduction, as it features all the main characters, an engaging story, and allows the reader to get sucked into the series and want to start at the beginning once they’re done. Originally written on April 26, 2017 ©Alex C. Telander. To purchase a copy of The Furthest Station from Amazon, and help support BookBanter, click HERE. If you’re any sort of epic fantasy fan, then by now you know full well who bestselling author Brandon Sanderson is. You may know him as the author who finished the long-spanning Wheel of Time series by the late Robert Jordan; or the creator of the fantastic Mistborn series; or perhaps you know him as the great mind behind his ongoing epic Stormlight Archive series. As a young adult reader, you may have also discovered him through some of his YA titles like The Rithmatist or the Reckoners trilogy, or perhaps even his Alcatraz series. In case you haven’t realized, the guy can write. What you may not know is that all his books and stories are intrinsically linked together in his Cosmere universe. I know. Woah! Just when you think the guy can’t astound you more, he does. Sanderson has mentioned and hinted at this over the years of his climbing to stardom and bestseller status, and now readers get their first full insight into this galaxy of wonders, and of course, it’s a heavy tome weighing in at 672 pages, in Arcanum Unbounded: The Cosmere Collection. The book collects a good amount of Sanderson’s short fiction. Of course, one can’t really consider these short stories, because when it comes to writing, the word means little to Sanderson unless he’s referring to a character’s stature. Each novella and novelette features an introduction by one of Sanderson’s knowledgeable characters about what they know about this particular planet and system and how this affects those who live on the world or worlds within it. The collection features nine tales, including an Elantris novella, a Mistborn story and novella that brings back an old beloved character. It features the first chapter for what became the script to his graphic novel, White Sands, as well as a sample of the great artwork. Included is also his novelette “Shadows for Silence in the Forests of Hell” which first appeared in the George R. R. Martin’s and Gardner Dozois’ anthology Dangerous Women, which features one of the strongest and most impressive female protagonists ever, and is one of Sanderson’s best stories. Period. Arcanum Unbounded also has a very nice and very long novella from his Stormlight Archive called “Edgedancer.” The book showcases impressive artwork of the planets and star systems, and is of course beautifully designed and executed, as is any high-class work from Tor books. 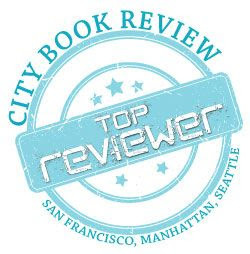 To purchase a copy of Arcanum Unbounded from Amazon, and help support BookBanter, click HERE. When people think of Sweden a number of cliche thoughts and preconceived notions come to mind. When they think of Swedish authors, they are likely two that come to mind: Stieg Larsson of The Girl with the Dragon Tattoo and John Ajvide Lindqvist of Let the Right One In. One is a thriller writer, the other horror, but what about speculative fiction? In Waiting for the Machines to Fall Asleep readers get to experience the genres of science fiction and fantasy in this fascinating anthology from the land of the midnight sun. 26 stories (some quite long) cover the gamut of the genres, with plenty of dystopian worlds spelling doom and gloom. Others will take you to other worlds, others to the future, and others to a very familiar place where things just aren’t quite right. “Melody of the Yellow Bard” is an unusual story about wormholes and how what you find on the other side isn’t always that great. “The Thirteenth Tower” is a moving tale set in a destroyed world where those within it learn of how good times were before. “The Road” is of an alternate world featuring a female marshal employed by the Road Council, charged with keeping everything in order. While the dystopian future is a common theme with a few of the stories, there are many others on diverse and unusual subjects, some short some long, providing a great smorgasbord (sorry, I had to) of stories for interested readers. Originally written on July 9, 2015 ©Alex C. Telander. 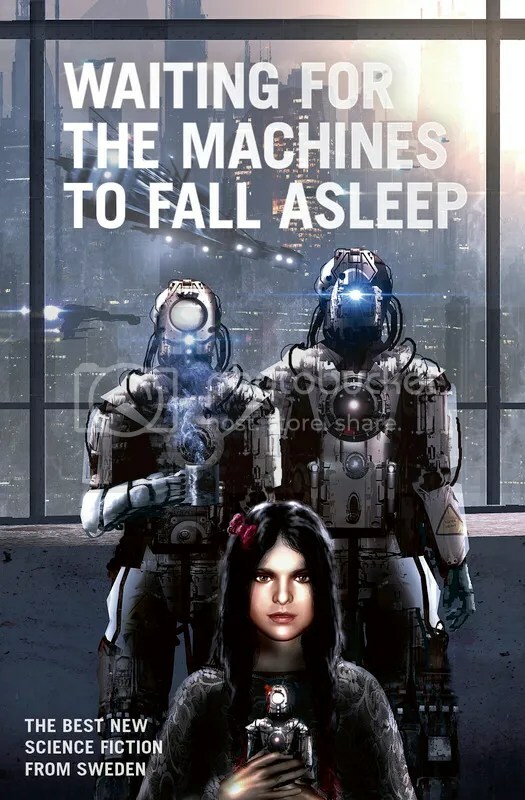 To purchase a copy of Waiting for the Machines to Fall Asleep from Amazon, and help support BookBanter, click HERE. The adventures of twinborn Waxillium Ladrian continue in The Bands of Mourning, who possess both Feruchemical and Allomantic abilities. 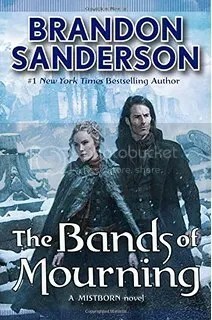 The second book in the “second trilogy” of the Mistborn novels focuses on the legend of the “bands of mourning,” mythical metalminds once owned by the Lord Ruler that have been lost to history and time that grant the wearer ability to control all the Allomantic powers that the Lord Ruler was able to possess. A kandra researcher – a species of creature that can live millennia by absorbing the bones of dead things (be they animal or human) and take on the form of that being – has returned to Elendel from its travels insane having lost its Allomantic spike and has clearly been attacked. But it also possesses drawings that supposedly depict the Bands of Mourning as well as writings in an unknown language. Wax is hired along with his “gang” of unusual characters including his fiancee to travel to the distant city of New Seran to investigate what happened to the kandra and possibly discover any validity to the drawings and writings. While the previous book, Shadows of Self, kept the story relatively short and simple, The Bands of Mourning reveals more of the complex world and history that readers have come to expect with Sanderson’s epic fantasy. Sanderson mixes addictive action scenes with fascinating history, along with healthy doses of humor and hijinks, for a very entertaining read. To purchase a copy of Bands of Mourning from Amazon, and help support BookBanter, click HERE. 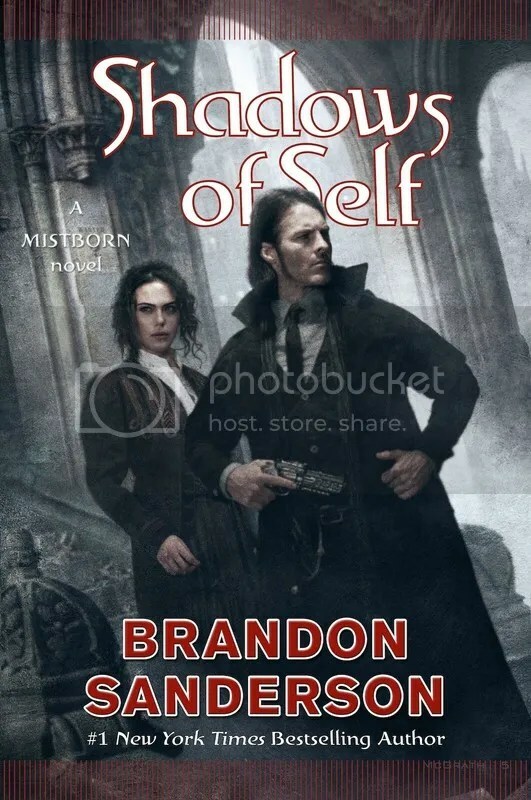 Brandon Sanderson really set the stage with his Mistborn trilogy that showed readers he truly knows how to spin a complex, detailed and fascinating yarn with some great magic and action. He’s also two books into his projected 10-book Stormlight Archive epic fantasy series. So readers wouldn’t expect Sanderson to return to his Mistborn world since he has lots of other stories to tell. But then again, if you know Sanderson at all, you’ll know he never likes saying goodbye to a world he created and is always willing to return to it, just not in the same time. Enter Alloy of Law, his standalone novel from 2011, and the first of the new trilogy, Shadows of Self, coming October 6th. He’s back in the Mistborn world a couple centuries further along in the future. If the first trilogy was set in a medieval fantasy period, the new trilogy is late 19th century with a healthy dose of the wild west. Waxillium “Wax” Ladrian has spent his time in the Roughs rounding up outlaws and as a “twinborn” is using both his Allomantic and Feruchemical abilities: he can push and pull on metals, but can also become lighter and heavier at will. Now he’s back in the metropolis of Elendel, Lord of House Ladrian, and can see the city is in turmoil as the nobility continues to become richer and fatter off the backs of the poor and downtrodden who are becoming angry and riotous. Then everything goes to hell when a strange intruder assassinates a number of important and purportedly corrupt nobility and it seems to be a creature from an earlier time. With the help of his close friend and sort of sidekick Wayne (think Badger from Firefly) who can create speed bubbles where he can speed up time, and Marasi who is working as researcher and investigator for the police department and is sister to Wax’s wife to be, she can also slow down time in her speed bubble; they need to find out who’s behind the assassinations before anyone else gets hurt. Sanderson has clearly had too much fun updating his “fantasy world” with things like guns, electricity and motorcars and lots of other technology reflecting our late 19th century period that are seen as an abomination by many in this world while there are those who can also perform Allomantic and Feruchemical magic. Even though the book is shorter – under 400 pages – than the books of the first trilogy, and the story isn’t quite as complex, he balances this out with some great shootout action scenes that will keep you glued to the page. And the really great news is that the second book in the trilogy, Bands of Mourning, is coming out January 2016, just a handful of months away! Originally written on September 17, 2015 ©Alex C. Telander. To purchase a copy of Shadows of Self from Amazon, and help support BookBanter, click HERE. Salman Rushdie has a way of taking something entertaining and wonderful and bringing it to a whole new level of brilliance. The title – Two Years Eight Months and Twenty-Eight Nights – may be better known by another, alternate one: One Thousand and One Nights. Right there you get where Rushdie is coming from with this book, which he lets on at the beginning of the book, starting long ago in the time of someone named Scheherazade and the world of the jinn. There is our world and there is also another, the world of the jinn. Sometimes the jinn come over into our world and do the things that jinn do. But then long ago, one jinn in particular, a princess of the jinn by the name of Dunia, coupled with a human male and gave birth to a brood of offspring, half-jinn half humans, that have bred down the generations leading to some of the main characters in the story. We jump to a time in the not too distant future where a storm strikes New York City and begins the time known as the strangenesses. Very strange things begin happening to people in everyday life. Such as those who can no longer touch the ground but are hovering a few inches above it and as time passes, hover ever higher. Or the graphic novelist who must face one of his creations come to life. Or the arrival of a strange baby who can identity those who are corrupt and liars and becomes an important implement of the mayor’s. It appears a war is raging and waging between the jinn in our world and mere humans are in many ways the victims. But the descendants of Dunia have some ways and abilities to fight back. 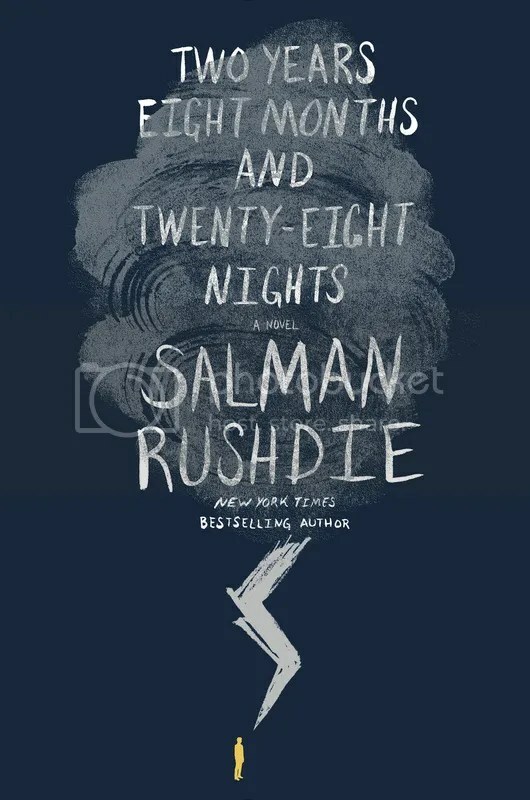 Rushdie has taken the premise of an already amazing story, modernized it and brought it into a new and higher realm that serves to blow the reader’s mind in some ways with its scope and detail. Just as One Thousand and One Nights has been addictive reading for many through time, so Two Years Eight Months and Twenty-Eight Nights is a rollicking tale fit to be read and enjoyed by many from now until the distant future. Originally written on October 31, 2015 ©Alex C. Telander. To purchase a copy of Two Years Eight Months and Twenty-Eight Nights from Amazon, and help support BookBanter, click HERE.